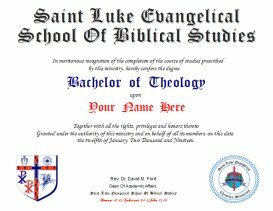 The degree is available in Traditional Format (above) and our new Photo-Personalized Format (scroll down to view). 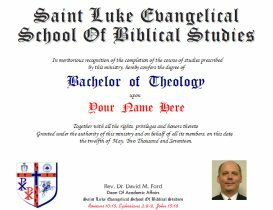 Saint Luke Evangelical School Of Biblical Studies can be used to earn your Bachelor of Theology degree, or simply as a resource for Christian Ministry. The degree is awarded based on the good-faith completion of the set of lessons in Theology. These lessons provide a solid basis for an understanding of God and the Christian religion. Your degree is awarded based on good-faith completion of these lessons, so there is no need to mail in any tests. When you order your degree we take that as indication that you've completed the lessons. The suggested contribution for this degree is $60. Follow the links below to print the lessons and tests for this program. The same degree as offered above, but personalized with your own headshot photo. You'll need to email your headshot photo to Brother Dave at stlukeministries@gmail.com. Includes laminated wallet-sized version (without photo). Available for a contribution of only $70! The following resources are not part of the curriculum, but are included here as valuable resources to our students and visitors.